Imagine an alternative Victorian history where gigantic mechanised war machines had been created to defeat the enemies of the British Empire. 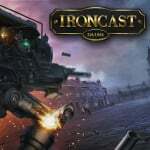 If that sounds good to you then Ironcast might well be the game for you; in this turn-based / match-three strategy game you will control a 7-metre tall walking Ironcast in order to defend 1880's Victorian England from an invading force. The publisher Ripstone has just let us know that it will be heading to Switch on the 10th August and it will be priced at £12.99 / $12.99 / €14.99. They are working on a trailer at the moment along with the team at developer Dreadbit, so that should arrive soon. I bought a Nintendo Switch at launch and I was really, REALLY excited about the concept of the console. After playing it for the first time I desperately wanted to bring Ironcast to Switch because it felt like the perfect platform for the game. Ironcast makes good use of the abilities of the Switch. You can play the game docked of course, in tabletop mode with a Pro Controller, on-the-move with either Joy-Con or by using the Switch touchscreen. The game even makes use of HD Rumble support for maximum Ironcast slaying fun. Battles within the game are fought by generating resource nodes which in turn drive the Ironcast's various weapons and systems. You must choose how to spend these nodes wisely; either offensively to cripple and destroy opponents, or defensively, if they suspect a barrage of incoming weapon fire is due. The game will include randomly generated missions, over 50 unlockable items and the potential for rare enemy loot drops. We gave this one a try in our Ironcast hands on impressions from E3. Will you be picking it up for your Switch in August? We need more decent steampunk games. Codename steam did NOT cut it. Is this game similar to Codename: STEAM? What's all this? Codename: S.T.E.A.M. is one of the best games on the 3DS. With that said, this is a match-3 game, apparently. Nothing like that. I did not care for the gem-match combat but that doesn't mean I won't like the game overall. I'll be holding off on this game. I am waiting for Steamworld Dig 2. @Nintendian Screw your profile picture I just tried to smoosh my screen. I've played a bit of this on PC. It's fun if you dig puzzle games. Should be good as a portable title as well. @Ralizah I think you're going to find yourself in a small fraction of the minority with that opinion. 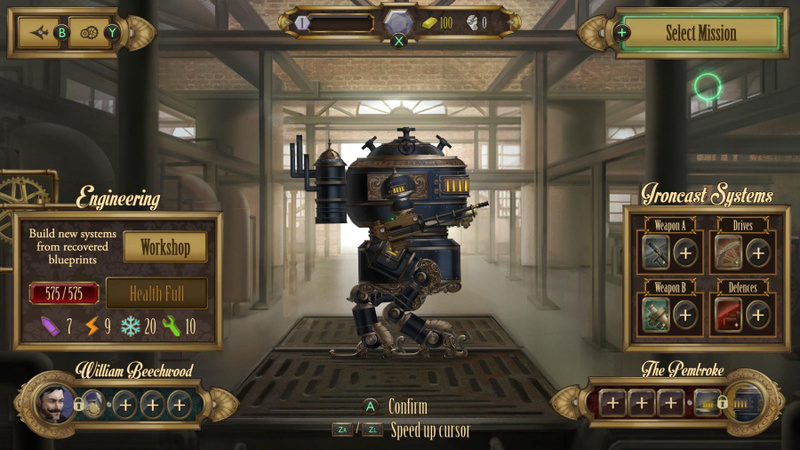 @Kalmaro This is a really good game, and it's Steampunk-themed. @abbyhitter No, it's nothing like it. It's a match-3-(or-more)-game, in the vein of puzzle quest, mixed with modern rogue-likes, featuring bits of progression, like FTL, Darkest Dungeon, Invisible Inc., Card Quest etc. pp. @Ralizah Codename S.T.E.A.M. was vastly underrated. Reviewers trashed it for not having an overhead map, but the mechanics, team abilities, and strategy were built around its absence and that made for a great experience. It's one of my favorite 3DS games, hands down. @Brumblescope GameStop is practically giving that game away for free. It's so cheap at that store. I've heard some pretty bad things about the STEAM reviews for this game, namely stuff like the Survival missions being designed to waste your hard earned resources, and the RNG nature of the game creating situations where skill literally doesn't matter, and you end up losing anyway. So yeah, I would be wary of this game, unless the developer fixed some of this stuff. @Bunkerneath You form chains to gather different types of resources, such as ammo, energy etc, and then strategise on how best to use those resources, such as deciding which weapon to fire and which enemy system to target, whether to use energy to increase shield defence or gamble on raising evasion and hoping enemy attacks miss, etc. It's not at all 'match three blocks and the robot does a firing animation', its deceptively complex. TotalBiscuit did a 'WTF is...' video on it that explains it pretty well. @abbyhitter yeah... I've seen it in the bargain bins for under $10 for sure. It's worth at least checking out if you like strategy games and enjoy a slower, thoughtful pace. @abbyhitter Amazon US has it for $9.19, right now. Everyone in the universe should buy it, (so they'll make a sequel). @Bunkerneath I don't know if this specific game is good, but it's definitely possible to form a meaty experience around match-3 mechanics. If you ever get the chance, check out Puzzle Quest: even as someone who isn't a huge fan of Bejeweled-style gameplay, I found it to be inspired. @Brumblescope Yep. It's built around tactical approaches to maps with a limited viewpoint, which is engaging and incredibly unique. Definitely the best IS game on the 3DS. @Kalmaro That's fine. It's a great game, and worth defending. Always like the sound of turn based strategy! Over 10€ for match-3 game is ludicrous. Sega should make a new Sakura Wars! @xPH03N1Xx86 I think the people have spoken as far as how good the game was, sadly. @Ralizah i agree completely that match 3 games can be great fun. Puzzle Quest and Galactic Quest are both really good examples. My favorite so far, however, is Gems of War (either on PC/mobile or PS4). That game, to me, is just such great fun. And add in the "online multiplayer" (saying it like that because you don't actually battle against other...just their decks/armies controlled by an AI) and the online chat room that's built into the game...and to me its a hit. Very deep game design when it comes to finding what cards work well together to form your little armies. I really REALLY hope the developers expand it out to a Switch version (the game is f2p on all systems...but you can of course spend money on the game shop for extra cards, etc), which would then be the third time I'd probably spend enough money on the game to get to VIP rank 3. lol... I wouldn't even mind starting all over again.